Today's defence-related news includes coverage of a review on retention in the armed forces, and reporting on an inquest into the death of a soldier who fought in Helmand. The Times reports that a review on retention within the armed forces has been ordered by the Prime Minister. The review will be carried out by Mark Francois MP, who initially investigated Army recruitment in 2017. Recruiting and retaining talent is one of our top priorities and we have a range of schemes, including retention pay for specialist trades and flexible working to make sure we attract and keep the skilled personnel we need. The military has enough personnel to meet all its operational requirements, including being active on 25 operations in 30 countries throughout the world. In the past year we have recruited over 13,000 people into the Armed Forces. Coverage in The Mail, The Telegraph and The Times reports on the the inquest of the death of Lance Corporal James Ross, who served in Afghanistan. The inquest commenced on February 4th 2019. 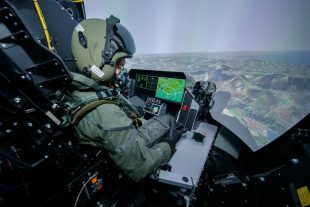 Chief of the Air Staff, Air Chief Marshal Sir Stephen Hillier in the gondola of the new High-G training facility at RAF Cranwell.